The Dallas Cowboys’ performance in the preseason loss to the Arizona Cardinals was hard to watch at times, but among the admittedly bad stuff, there were some nice things to glean as well. It was an odd matchup as the Cowboys gave up on the entire “dress rehearsal” idea, at least on offense. But the defense was just flat impressive early on. So here are some things from the stats that we can ponder. Eight giveaways. Zero takeaways. That alone ensured the loss, and frankly, had it not been for the play of the defense, the score should have been much worse than the final 27-3 tally. And Dallas found plenty of different ways to cough up the ball. Two interceptions (one a pick-six), three fumbles, and two muffed punts (one of which also turned into a touchdown). It was terrible. But of note, none of the turnovers were committed by starters, and only the Rod Smith and Blake Jarwin fumbles were on players that are likely to see much time in games. Even if Lance Lenoir does make the team (which still looks fairly likely), he may no longer be an option as a punt returner. If he is, he needs to spend a lot of time working on fielding punts to overcome his issues of bad hands and worse decisions. The change from the first two preseason games is obvious. They had five takeaways and had not lost a turnover the first two. It seems obvious the large contingent of offensive starters that were enclosed in bubble wrap on the sidelines in the third game has a lot to do with things. And that parade of mistakes is going to give the coaches a lot of ammunition to pound the importance of protecting the ball into the players. Let us hope that pays off. During the first half, when the Cardinals had most of their better offensive players on the field, the Cowboys held them to only 36 yards passing, and the only points yielded (after many of Dallas’ starters were on the sidelines) came on a field goal following one of the Lenoir muffs. The pass rush was strong, the run defense only really got gashed once, and the secondary looked strong as well, with Chidobe Awuzie especially good. If there is to be some rust for Ezekiel Elliott, Dak Prescott, and the receivers to knock off, the defense can make a real difference in the early games. And judging by what we have seen, it is ready for that. If you define a splash play as one that gets 20 yards or more, the Cowboys came up empty. The longest run was for a paltry seven yards, and two passes went for 19 – one to RB Trey Williams, who is not going to make the roster, and the other to Geoff Swaim, the presumptive TE1. There were a couple of opportunities to get big plays, but overthrows by the quarterbacks led to nothing. Again, this was without Elliott or Prescott being involved, but clearly the team needs to get some chunk plays on offense. That has to involve the two real keys to the offense. Hopefully we will see them come when the games count. On the flip side, the defense only allowed two, both runs, but one was huge. T.J. Logan burst through the line for a 59-yard touchdown run that elicited a real explosion from Kris Richard on the sidelines. It was again a breakdown by backups and players who won’t make the roster, but the new defensive assistant made sure they knew that it was completely unacceptable to blow a play like that under any circumstances. Speaking of Rico . . .
His situation remains muddy. He was the leading receiver in catches, with five for 30 yards, but it was not all good for him. There were still times he did not seem to understand his assignment, or just executed it very poorly. The team is still going to have to decide if his ability to catch the ball outweighs his deficiencies elsewhere. He has one more game to try and show improvement, but with only one more padded practice before the preseason finale against the Houston Texans, time is running out. Cooper Rush continues to struggle, looking nothing like the player he was in the 2017 preseason. Mike White finally strung together some good downs, at one point going eleven of eleven before the wheels came off with a fumble and an interception. Backup QB has turned into a real concern. 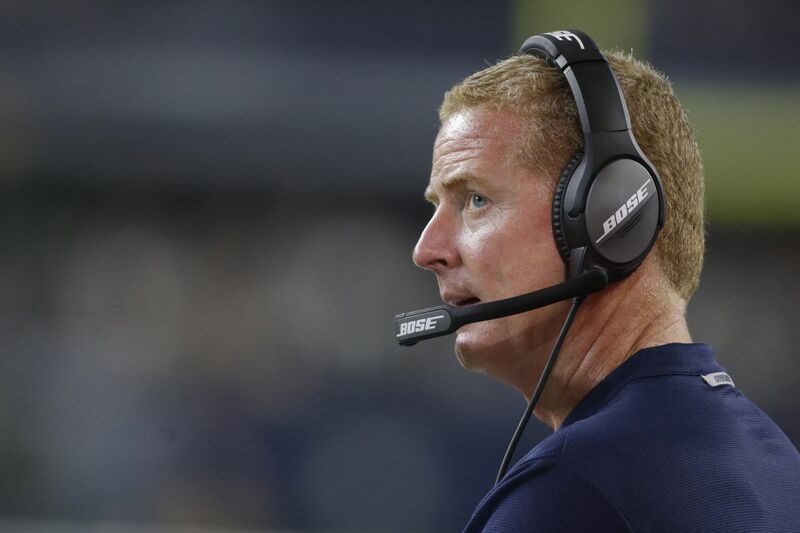 In the past, Jason Garrett has had a preference for having a veteran backup, and with how things have gone, it may be time to return to that approach. The question is just who? The pickings are slim across the league. If Prescott stays healthy, it won’t matter. But we have seen how disastrous hoping for health can be. Xavier Woods is not a sure thing to be ready for the start of the regular season. Kavon Frazierwas playing well, but separated his shoulder only seven plays into his night. He says he will be good to go, but what is there behind them and Jeff Heath (who thankfully got out of the game unscathed despite seeing a lot of work)? Tyree Robinson and Marqueston Huff saw the most work among the backups, but Huff had a major whiff on that long run by Logan. It is increasingly clear that the team needs to find help from outside the current roster, but the Seattle Seahawks are showing no indication of budging on Earl Thomas. Look for someone to be added. It could be someone currently available, since there are still some good safeties without a job. Eric Reid is the best out there, but the team may not be willing to take him on given the charged atmosphere over the protest movement. More likely, they will make a waiver claim, or more than one depending on which other teams are in the market with a higher priority in the formula. This is also a need since the team almost certainly will carry five corners. And here the snap counts combine with performance to indicate who is likely to get the nod. Charvarius Ward saw the most snaps of any corner, as well as a decent bit of special teams work, and acquitted himself well. He was in on two tackles and, more importantly, had two passes defended credit to him. He is one UDFA that may just be earning himself a job. This was a hard game to glean much from the stats, given the players that were not on the field and the heavy workload given to many who will not make the roster late this week. Those are seven things that I saw in the numbers. Let us know if you found anything else.